Vassilikos is a group of houses scattered in the countryside south of the island alternating to churches and little shops for the tourist. The name of Vassilikos is associated more to a densely covered with Mediterranean scrub area than to a town, with a large pine wood and numerous sandy beaches characterized by a quiet atmosphere with luxury structures in the backcountry and bars for young people on the beach. The peninsula of Vassilikos is the area that goes from Argasi down to Gerakas beach, which is the most southern beach of Zakynthos island. In Vassilikos area there are several groups of houses where there are the larger beaches, but there isn't a real village with its center. 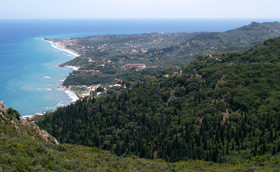 Vassilikos more than a town it is a rich in vegetation area where there are many beaches all equipped for the tourist. The most popular beaches of this area are: Porto Kaminia, Porto Zoro, Banana Beach, Agios Nikolaos, Plaka, Porto Roma and Gerakas. 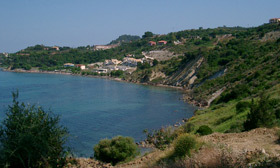 Vassilikos is connected to Zakynthos by bus with daily runs. It is possible to rent cars, jeeps, motorbikes or bicycles to move around the island. It is possible to find mini markets, bakeries, shops selling souvenirs but the choice is not as wide as in other parts of the island. This is a very quiet area and in the evening there are many choices where to eat like typical taverns and restaurants where to eat fish; it isn’t very well organized from the night life point of view. Instead, during the day, the fun takes place on the beach as the southernmost beaches are equipped with volleyball courts, water sports, music bars and more. Vassilikos offers different lodges solutions such as villas in the greenness, hotels close to the sea, apartments and studios with a small kitchen. This area is much more looked after compared to others and there are many luxury lodges that can host you during your holiday.